Former Rangers owner Craig Whyte has claimed he introduced Charles Green to Duff and Phelps as the administrators searched for a buyer for the club. In a wide-ranging BBC interview, Mr Whyte said he and his advisors "went out and used our contacts" in London "to put a suitable deal together". Rangers chief executive Mr Green said Mr Whyte had painted "a misleading picture of what actually happened". He said his team contacted Mr Whyte as it thought his shares might be needed. Rangers, under Whyte's control, was forced into administration by HM Revenue and Customs (HMRC) on 14 February over non-payment of tax totalling about £14m. After HMRC rejected proposals for a creditors agreement that would have allowed the old club to continue, administrators Duff and Phelps negotiated a sale of assets to a consortium led by Mr Green for £5.5m. He has since formed a new club, now playing in the Scottish Football League Third Division. Speaking exclusively to BBC Scotland's Chris McLaughlin, Whyte said he had played a key role in the sale. "I was the one who found a buyer - it wasn't Duff and Phelps," he said. "My colleagues in London - when no credible buyer was coming forward - went out and used our contacts in the city to find… to put a suitable deal together." When asked if he was the one who had brought Mr Green to the table, Whyte answered: "Absolutely. I introduced them to Duff and Phelps." Asked if his relationship with Charles Green and Rangers was okay, he replied: "Yeah, sure. "I think given the public perception of me, people are keen to distance themselves from me publicly. "But I have no problem with the current management of Rangers." Mr Whyte's version of events, however, is comprehensively disputed by Mr Green. In a statement, the Rangers chief executive said: "Yet again Craig Whyte's version of events paints a misleading picture of what actually happened and it's regrettable that the BBC is providing him with such a platform. "The facts are that direct contact was made by our consortium with Craig Whyte in the first instance as it appeared at that time that his shares would have to be secured in order for any purchase of the club to progress. "I was not present when contact was initially made but subsequently met Craig Whyte, who introduced me to the administrator." 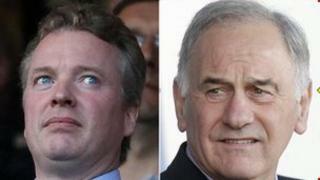 Mr Green said he had "no previous association with Craig Whyte" and it was "misleading to suggest he 'brought us in'." He added: "I was brought to the transaction by Imran Ahmad following Duff and Phelps contacting Zeus Capital in February, due to their experience in the football sector." Full details of the Craig Whyte interview, and reaction to it, will be on the BBC Scotland news website and on Reporting Scotland at 18:30. There will be further analysis and discussion on Newsnight Scotland at 23:00 on BBC2 Scotland.